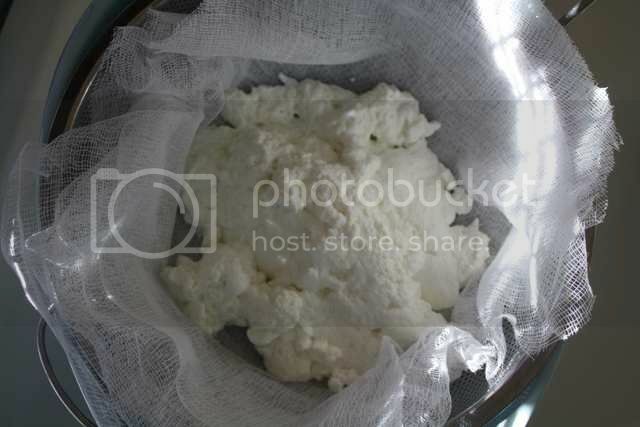 Making ricotta at home is something that never really occured to me, but I have fantasies about raising goats and sheep in my backyard to make my own cheese. So, when I saw Bon Appetit's article on making ricotta, I knew I had to give it a try. Perhaps I would find something to quell the at-home cheesemaking craving until I can buy that farm in Oregon. Ricotta isn't technically a cheese. Literally translated to mean "recooked," ricotta is made from whey, the by-product of cheese-making. Since I am still without that backyard herd and as such, whey-less, I used Bon Appetit's method of adding salt and lemon juice to milk to create the curds that form ricotta. If you're going to try this at home (and by all means, you should), unlike me, make sure you pay attention to Bon Appetit's recommendation that you only drain the ricotta for a minute or two and cover it when you put it in the fridge to cool. Although it looked moist to start, my ricotta ended up drier than I would have liked. It still tasted great and worked well with the pesto and broccoli that I served it with. This may not take the place of having my own farm where I can raise goats to make my own cheese, but it sure tastes good in the meantime. Enjoy! Bring milk and salt to a simmer in a heavy bottomed saucepan. 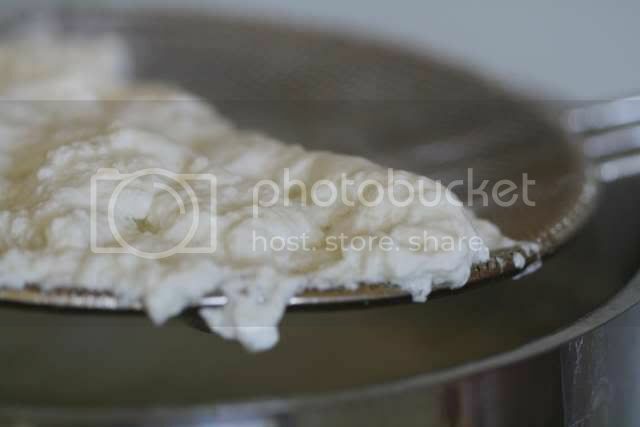 While milk is heating, place four layers of cheesecloth in a colander over a medium bowl. When milk comes to a simmer, pour in lemon juice and continue to simmer until curds form. Use a metal skimmer to lift the curds out and transfer to the prepared colander. Let the curds drain for just a minute or two (really - they will dry out more as they cool) and transfer them to a small bowl. Cover with saran wrap and place in the fridge to cool. Serve ricotta on freshly made bread with a drizzle of honey or in place of the goat cheese in this simple dessert. 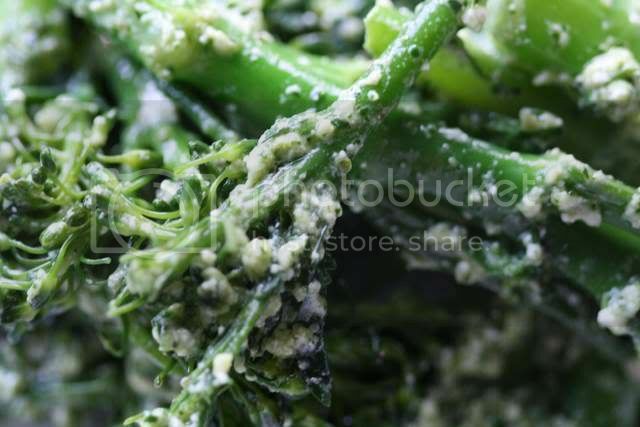 The day I made the ricotta, I had just brought home some broccoli rabe. I steamed the broccoli and tossed it with a mixture of the fresh ricotta and leftover arugula pesto. I am impressed great job. Ricotta is the best! Oh lovely! What a great way to serve broccoli and I was amazed at how easy the ricotta was to make. I read the Bon Appetit article and thought maybe I should try it. You've convinced me. We do have so many great cheeses here in Oregon. Its fun to try to make one in my own kitchen. wow that looks so easy - I love ricotta and will definitely be giving this a try! I have an engineering degree but I do more financial analysis now. I take technical requirements and determine how much it would cost to implement requirements or develop products. I am definitely going to try this recipe. i tried making ricotta once and it was so unflavorful and i was so disappointed that i have been turned off ever since. it's a new year, however, and i feel ready to give it a stab again. i totally want to raise chickens and goats in my backyard too. After reading Animal Vegetabler Miracle I was inspired to try making my own cheese. I have yet to do it though. You ricotta looks so wonderfully creamy. Great job. This is brilliant! Thanks for showing us how easy it is! I can't wait to try making ricotta! Your pictures are always amazing and inspiring. It looks like it has the perfect texture; it sounds fresh and delicious :). You are brilliant. I am so impressed that you tried this! Out of curiosity, what weight of ricotta did the 2L of milk produce? Oh wow! I have been making this cheese since 1987. Just one step more, pressing the curds under a heavy flat weight for an hour, gives me enough paneer (cheese) to make a side dish of Palak Paneer for supper. That's Spinach and Cheece in English. I am impressed great job.